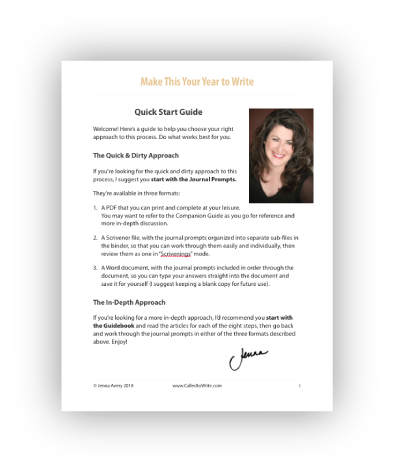 Check out the detailed 8-step Guidebook and Journal I’ve created to walk you through the journey to clarity for your writing career and year ahead. My Make This Your Year to Write process includes everything you need to make this year a writing year to remember. Wouldn't it be incredible to have a solid vision for your writing year ahead? I see so many writers setting unrealistic and impractical goals for their writing and then feeling like failures at year’s end, vowing to do more and better in the new year. What if you set attainable goals right now and had a workable plan to help you make your writing dreams for the year ahead come true? I’ve put together a special process called Make This Your Year to Write to help you make the most of the coming year. Take a look and see what’s inside. I think you’ll really like it. In the Make This Your Year to Write program I’ll walk you step-by-step through the journal prompts designed to help you complete your prior year and get ready to make the most of the upcoming year with your writing — including setting actionable, achievable writing goals. We’ll spend time reflecting on your writing life and career and the last year, so you feel complete about what you’ve done so far before mapping out where you’re going next. We’ll identify the writing patterns and challenges you tend to face so you can make effective plans for how you’ll manage them in the coming year. We’ll tap into what you want for your writing life in terms of the day-to-day experience you’re wanting to create for yourself. We’ll examine the gap between where you are now and where you want to go so you can make clear decisions about what to add and what to take away from your writing life to make it work better for you. We’ll tune into your vision for your writing career so you’re 100% clear about what you’re wanting — which will help you stay the course when the going gets tough. We’ll set attainable goals for your writing year so you’ll feel great about what you’ve accomplished at the end of the year. I’ll help you make sure you set goals that work. We’ll plot out a timeline for your writing plan for the year so you feel confident in your ability to meet your goals — and so you know where to start! We’ll create a support system to keep track of your goals and help make your writing happen so meeting your writing goals becomes your reality. The writers who have worked with my Guidebook were blown away at the clarity and insight they received about their writing plans and goals. 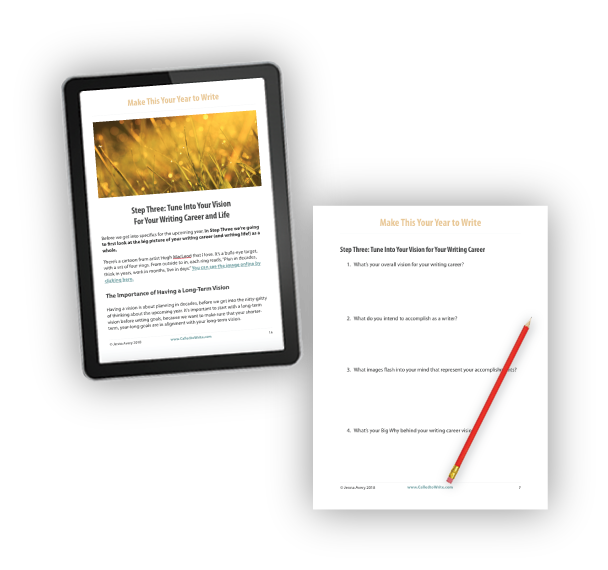 You’ll receive the Guidebook to take you step-by-step through the process of answering all the questions you need to address for the coming year. Along with the Guidebook, you’ll receive a Workbook Journal in a Printable PDF format (and the other format choices below!). If you like to handwrite journal answers, this will be the format for you, since you’ll be able to print out the pretty pages and sit down with a cup of tea to daydream and write your way through the process. If you’re more of a typist and a Scrivener fan (like me), you’ll want to have your vision and goals work inside your go-to favorite writing tool. I’ve created a Scrivener version of the Journal so you’ll have all the prompts, right there in the Binder, ready to go inside a special Scrivener project file. You can keep it as its own project, or drag and drop the prompts into another Scrivener file — as you like! Save a tree! Die-hard Word fans will love having the Journal in a Word based format. 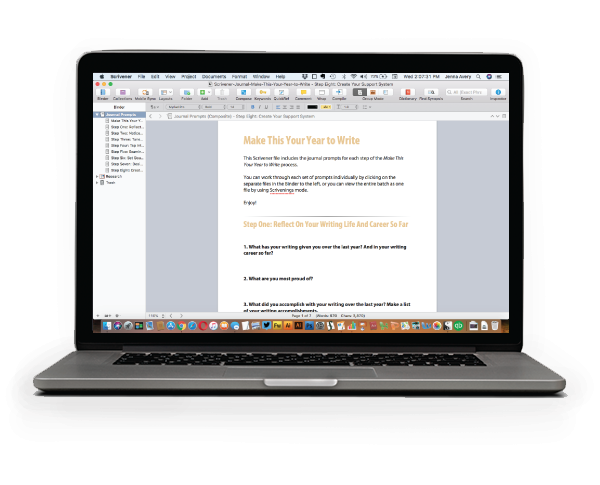 It’s a breeze to type your answers in and save your file with all your work in one place on your hard-drive in the writing program you love the best. I’ve also included a brief one-page “Quick Start Guide” to help you jump in and get going right away, so whether you want to take the quick-and-dirty or in-depth approach, I’ve got you covered. You’ll “complete” your prior year’s work in a safe context so you can begin the upcoming year with a fresh heart and clear mind (no guilt!). You’ll have a clear sense of purpose about your future and direction as a writer. You’ll have a guiding vision and intention for your writing in the coming year. You’ll walk away with solid writing goals and a plan to help you implement them. You’ll feel better about yourself and your writing when you’re more intentional with your days and your goal-setting. 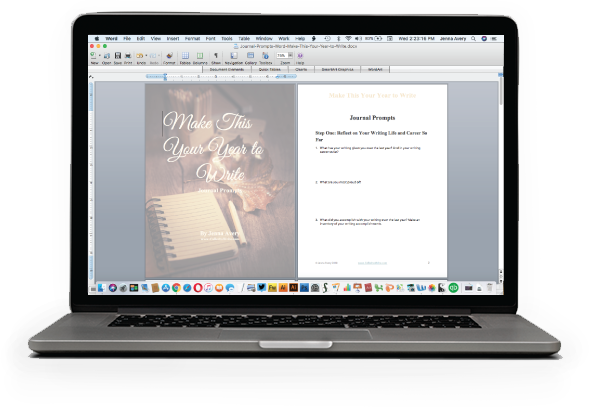 When you pick up Make This Your Year to Write, you’ll download the Guidebook and three Journal formats within minutes so you can get started with them right away. 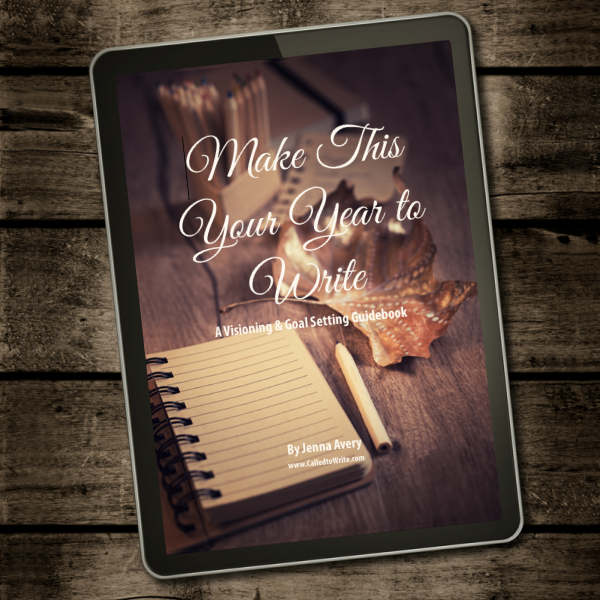 Pick up Make This Your Year to Write for only $27 $17 today. And may your writing year be joyful and productive! 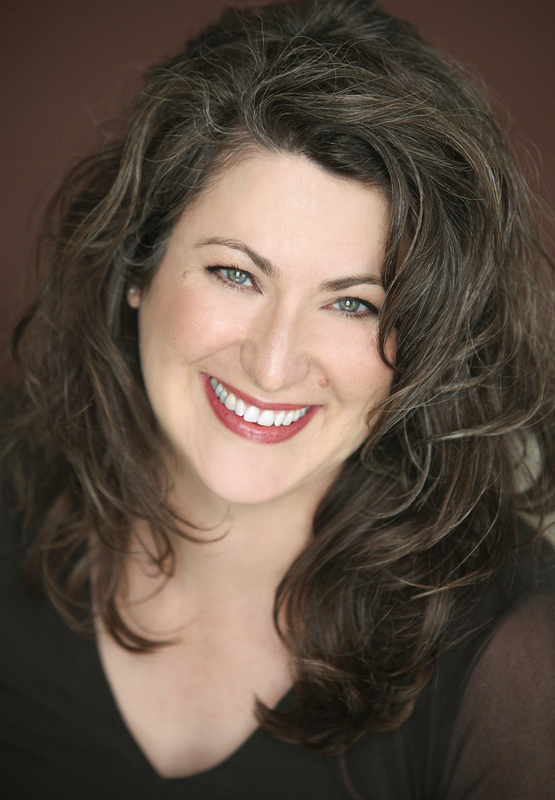 Answers to common questions about my Make This Your Year to Write process, just for you. Got another question that’s not answered here? Just ask! How will this help me if I didn't achieve my prior year's goals? At the beginning of the year, we often optimistically set overly ambitious goals and set ourselves up for failure. There are a variety of reasons we do this, including setting goals outside of our own writing career vision and trying to please other people, trying to measure up to what our peers our doing, using “magical thinking” about our time and energy capabilities and more. 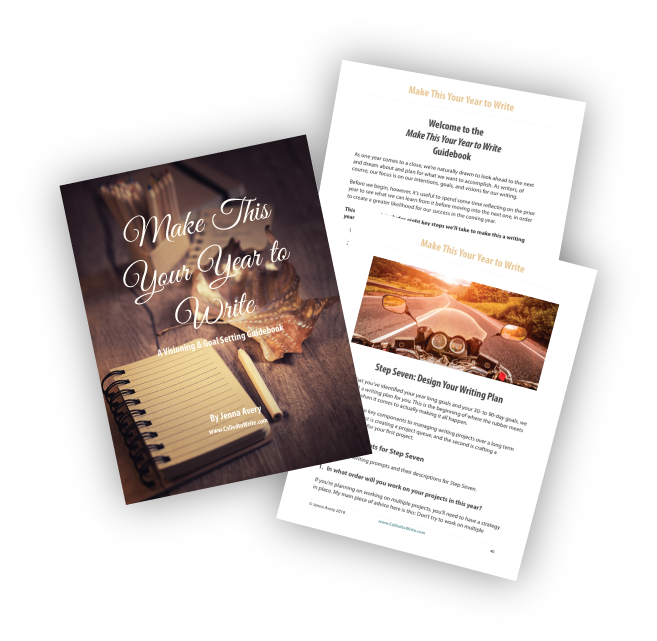 The Make This Your Year to Write process helps you take a compassionate, non-judgmental look at what worked and what didn’t in your prior writing year, so you can set realistic, attainable goals that are also inspiring to you. Is this different from the retreat and workshop versions you've lead? This is the same content — but in a home-study, self-directed version. How does this differ from other goal setting programs? This program is specifically focused on writing goals. While other goal setting programs tend to focus on goal setting in general, in this process we address goal setting within the context of writing, which means that we look at word counts, page counts, and minute goals, as well as setting goals that work with long-form writing projects in particular. What's the difference between goals and vision, and why do I need a vision? A goal is a specific outcome you’re aiming to achieve. A vision is your larger dream about what you’re doing and why. Your goals will ideally be part of achieving your vision (as opposed to being things you’re trying to achieve for someone else’s vision for your life, or that take you in a different direction than you ultimately want to go). Having a vision helps you make sure you’re on track with what you actually want to create for your life in the coming year and beyond.